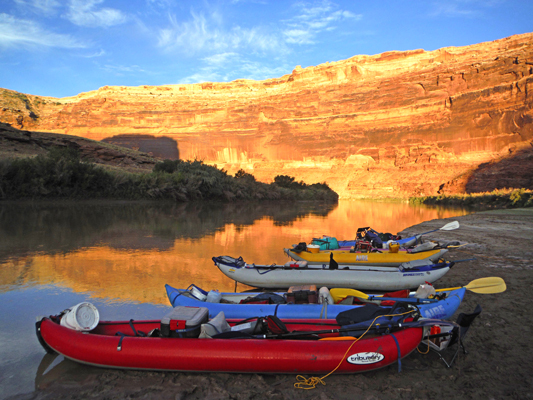 In mid-September, six friends and I launched from Crystal Geyser on a float trip through the Labyrinth Canyon of the Green River. Our plan was to be out for 6 days and travel about 62 miles in inflatable kayaks. This was my first trip on the river. Most of the others had been through here several times. Our plan was to paddle for about 10 miles each day. That would leave time to explore around a bit at several interesting places that the guys knew. John Wesley Powell named the canyon in 1869. It is known for its calm water, scenic views, and human history. 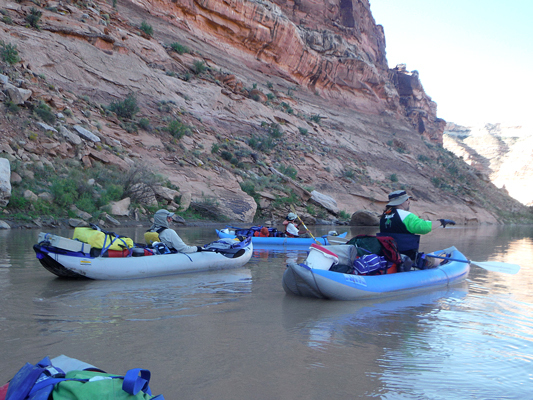 Tex's Riverways, a commercial shuttle company out of Moab drove us, our boats and other gear out to the launch site. They got us there by mid-morning on September 13th. The conditions down at the river's edge were an indication of what we would experience for the remainder of the trip-- tall steep banks and lots of sticky mud! It was necessary to load our IK's on the bank, and then while standing ankle deep in the muddy ooze pull the boats off of the ledge into the water. It was not an easy launch. The parting words from the shuttle drivers were for us to be at Mineral Bottom, the take out, by 10:30 Saturday morning the 20th and to not be late! In the excitement of getting onto the river, I had forgotten to take a walk over to the geyser and look it over. It was only after I was out on the water and saw its orange and yellow travertine terraces that I remembered that I had wanted to get a close-up look at the feature and perhaps see it erupt. Crystal Geyser came into being after an attempt to drill for oil failed back in the 1930's. From what I understand the geyser erupts when carbon dioxide is forcibly released as the water comes to the surface of the old drill hole. Crystal is not a thermal geyser. Eruptions can apparently reach many feet into the air. Our most exciting wild animal contact of the trip occurred on the first day. As we floated along, a bear was seen standing in a clearing on river right. Once it spotted us, it did not take long for him to clear out. 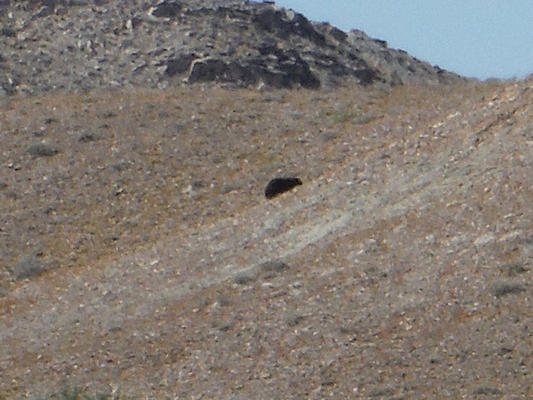 By the time I could get to my camera, he was just a speck on the distant hillside. This trip was my third river float and I am still a hesitant river runner. I was not upset that the water here in the Green River was calm and non-combative. On each of my two previous trips, I had ended up backwards in two different rapids. I was told that was not going to happen on this trip. There were no rapids to spin me around. I am not certain how the river got its name. It certainly was not from its color. I do not believe that I have seen more silt in any other river. The experienced guys in the group decided that we would shoot for a camp on river left near Anvil Bottom at river mile 102. We had started near 115.5. To make 12 or 13 miles was very good after the late morning start. The campsite at Anvil Bottom was flooded out . We had passed a sandy beach just upstream. With some effort we were able to reverse our direction and paddle against the current back to the beach. It was guarded by a mud bar, but there was a rocky pathway through it to the sand. The downside was that it was a lengthy carry to get our gear from the boats to the sand. Dellenbaugh Butte was visible across the river. This butte was named for one of Wesley Powell's crew who was on the 1869 expedition. The feature is also known as the "Anvil" or "The Inkwell". When we took out at Mineral Bottom, one of the canoe trips that launched while we were there was led by one of Dellenbaugh's descendants, Anne Dellenbaugh. The afternoon was spent relaxing in the shade of the cottonwood trees west of the campsite. Once the day started to cool, camp was setup on the sand. The trip had begun on a Sunday under clear skies. Rain was not forecast in the area until the following Thursday. However, when we woke up Monday morning, it was overcast and there were a few sprinkles. As we rushed to pack our gear we wondered how the weather folks had gotten the forecast so wrong? Fortunately, it never really opened up on us and the skies cleared within a few hours. The guys knew of a second geyser back away from the river a short distance downstream from our camp. So it was not long after the morning's launch that we pulled up to the bank on river right and walked over to check it out. As can be seen in the photos, nothing seems to grow around the pond. There were no tracks of any critters close by. This is also a CO2 geyser that was the product of another test hole that did not pan out for oil. That was not going to be an issue on this trip! The nature of the canyon changed near Ruby Ranch. The countryside prior to this location had been open with a few low bluffs. Tall rocky cliffs close to the water began to appear. This was the beginning of Labyrinth Canyon. The objective for the 2nd day had been to stop and camp at Trin Alcove near river mile 90. The alcove, a junction of three side canyons, was supposed to be an interesting area to explore. Although we arrived early in the day, the camp sites were already occupied by several groups. We waved to the folks on the shore and continued on downstream. 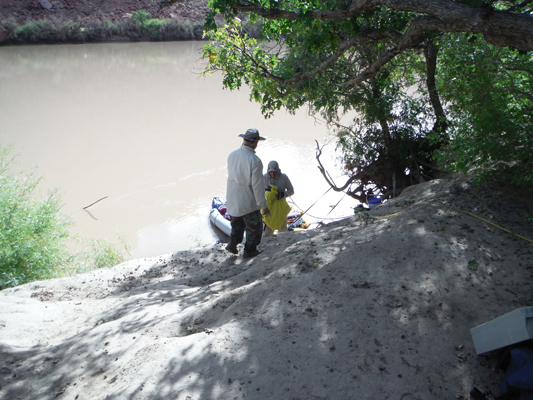 Several other campsites were not too accessible, either because of the mud or the very high banks to climb. The advance scouts in our group remembered a site near mile 84.5. That site proved to be very useable. Since the landing was downstream and tucked in behind a large boulder, a look-out was posted to make sure that the stragglers in the group would be aware of what was needed to make the quick turn onto the small beach. This campsite had a view of "Bull Hollow" across the river. A better campsite could not have been asked for. It was large and shady with plenty of level places to pitch a tent. The outstanding feature of the site was an inscription scratched into a nearby cliff face. It was apparently a notice left by the crewmembers of the steam powered stern wheelers named Marguerite and Utah. These boats had once operated on the Green River and the Colorado River carrying passengers and freight. The date was November 20, 1909. In the two days so far, we had covered approximately 28 miles, nearly half the distance from Crystal Geyser to Mineral Bottom. At this rate we were going to get to our destination way too early. Thoughts of a layover day began to enter our minds. To occupy some of my time at this camp, I dipped a bucket of water out of the river and sprinkled some alum powder into it and let it stand for a few hours. I was curious how successful this process would be at settling the silt. It seemed to work really well. I carefully skimmed a couple of liters off, boiled it and then used it to re-hydrate my freeze dried dinner. I used more the next morning in my morning coffee. Later in the trip, I repeated the process. That time I used my water filter to pump a couple of liters of clean water into bottles for future use. I really did not need to do this. I had on board nearly 5 gallons of water. The activity was something interesting to do. Downriver the next morning at about 7 miles from the Bull Hollow area, we came upon the boulders at the base of a tall cliff known as Register Rocks. 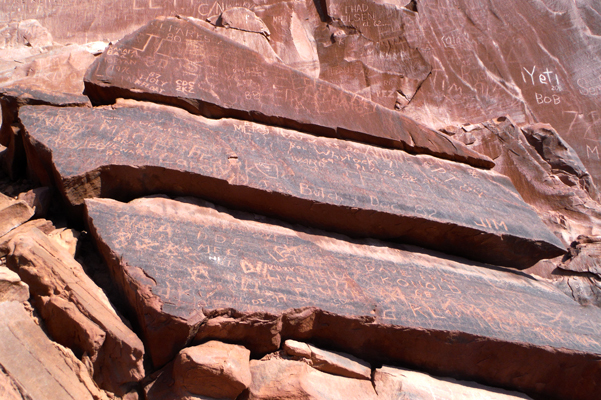 Here "artwork" and hundreds of names have been scratched into the rock surfaces. 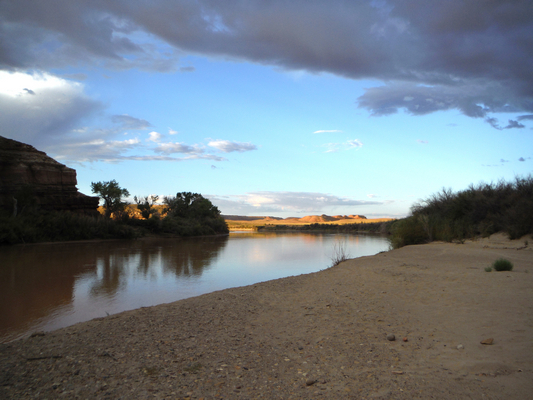 The photo below was taken from Register Rocks out to a meander of the Green River. Our objective for the 3rd day was the mouth of Hey Joe Canyon near river mile 76. Once we arrived there, we found the access to the canyon completely blocked by a wide strip of mud and impenetrable vegetation. That was quite a disappointment. 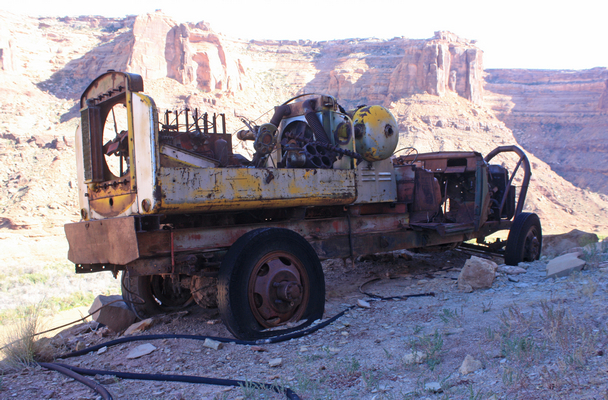 The guys had wanted me to see the old mines and equipment that remained up in the canyon. A conversation with a river guide directing a sea kayak group led us to a camp on a riverside beach near the rock inscription "Launch Marguerite"at river mile 73. This inscription on river left consisting of 3' tall letters noted the passage of the boat in September of 1909. The photo below of the beach campsite shows the wide strip of mud that was an obstacle to nearly every riverside destination. River flows during our trip averaged 3000 cfs. The river had flash flooded to nearly 8000 cfs the week before. The mud was probably the result of that flooding. The timing was our bad luck. The beach site had recently been used by others and a narrow and relatively "dry" path had been tramped through the mud. This allowed access from our boats through to the sand. Daytime temperatures during the trip reached into the low 90's. The guys from the cooler climates felt like they were baking. That there was no shade aggravated the situation. It was not enough that everyone had an umbrella. Late in the afternoon, a pair of BLM rangers rowing a dory pulled in and asked to see our permits. They were very friendly. The next morning as we continued on the river, the scenery was once again spectacular. It was somewhat frustrating knowing that many of the areas off to the side were not accessible because of the recent flooding. We had to be content to enjoy what we could see from the river and wonder what was up in those side canyons that we passed. One of the main objectives of the trip had been to stop on river right between river miles 68 and 66 to check out old mining equipment that had been spotted by one of the guys on an earlier trip. With the thick vegetation and mud that had been encountered already, it was unknown whether we were going to be able to make a landing. Our 4th day was spent paddling toward the location of the old equipment. We would know that we were in the area when we got to Spring Canyon on river left. As we slowly drifted along past the mouth of the canyon we were on the lookout for any openings. Around river mile 67, the break came. There was an opening in the trees and brush and there was little mud. The downside was that it was going to be a steep climb to get our gear up to the top of the high banks. A handline made the transfer of gear much easier to accomplish. As it turned out this was a great camp area. It was very shady with a lot of tent sites. There was a bit of a mosquito issue, but nothing that repellant couldn't handle. We had not been there long, when a couple of state natural resources people stopped by. They were surveying campsites along the river to see what improvements could be made. In the 1950's the west side of the river between miles 68 and 66 was the scene of uranium prospecting and mining. Relics of that activity remain today. I have written a separate description of what we found as we explored the area from this camp. The photos below are of some of those relics. I believe that the cable anchor was part of an aerial cable system that once spanned the river. It was apparently used to transport men and materials across the river. A second cable system that also remains was perhaps part of an old cable ferry that was used to transport vehicles across the river. At one of the mine sites, an old wooden ore chute is still standing. Elsewhere there are a couple of miners' shacks. High on a talus slope, several vehicles remain. The photo below is of one of those vehicles. The morning of the 5th day found us with two days left to travel to our take out at Mineral Bottom at river mile 52, 15 miles away. It was decided that we would look for a spot six or seven miles downstream, spend the night, and then finish up the trip with a final leg of eight or nine miles on day six. 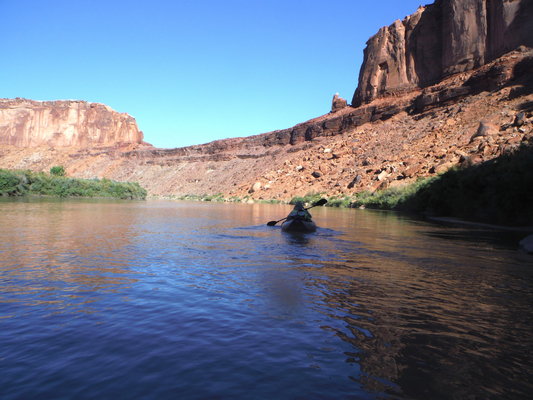 Once underway again, we paddled by several very scenic sandstone towers. And it was not far to the final turn of Bowknot Bend. This is a spot where the river comes within a thousand feet or so of cutting itself off. In the photo below, the upstream side of the Green River is just beyond the low skyline ridge. By river, it is seven miles back around to that spot. 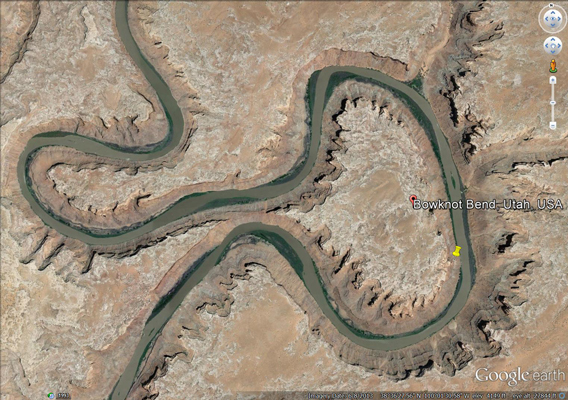 The photo below is a Google Earth View of Bowknot Bend. The location of the photo above can clearly be seen. The mouth of Horseshoe Canyon was about 7 miles from where we had launched. 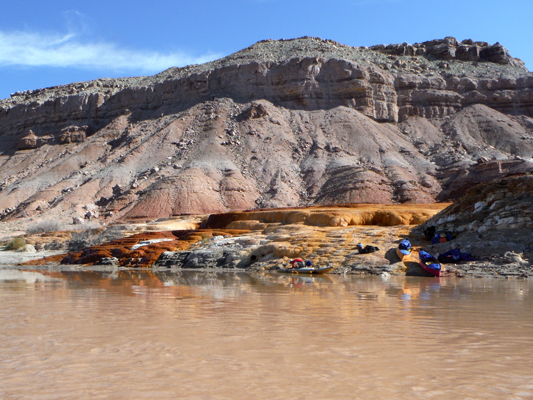 Once again, another extensive mud bar prevented any landing anywhere near the mouth of the canyon. This canyon was also supposed to be a good place to explore. But not this trip. There was really no choice but to continue on down river. After a few more miles, it became evident that the only take-out that day was going to be at our final destination Mineral Bottom. So instead of arriving on the morning of the 7th day or the evening before, we were there at the end of day 5, a day and a half early. There was little choice but to set-up a camp at the takeout and wait for our ride. Fortunately there was a clear area near the ramp with plenty of shade. We did not have to carry all of our equipment and our boats very far. Much of our remaining time was spent "people watching" as groups arrived or departed. That was actually pretty entertaining. There were times when the ramp was really congested with multiple groups trying to launch or take out at the same time. Mineral Bottom is a popular put in for the trip on down the Green River through Stillwater Canyon to the confluence with the Colorado River. On Friday, our shuttle company was in the area to drop off a group and offered us a ride out. Our hotel reservations were not until Saturday evening, so with no place to go we decided to stay put. Several of us used the time at Mineral Bottom to investiage that area. Not too far away, there was an old uranium mine with a bit of debris scattered about. The horizontal diggings were quite extensive. 4.5 miles up the river from Mineral Bottom in Roaring Springs Canyon there is a rock inscription left by an early fur trapper. He was apparently in the Green River area in 1836. Several of us hiked the old mine road from Mineral Bottom up to Roaring Springs Canyon to find the inscription. On Saturday morning, two vans from Tex's Riverways arrived with a large group of folks and many canoes. Once they were unloaded, we quickly got our gear on board. It was then an interesting ride up the primitive road out of Mineral Canyon.